At the recent Techbrew Talk inDublin, Tenego CEO Donagh Kiernan, looked at the pros and cons of partnering versus direct sales. “In developing and growing your business the constant question is how you effectively lift the business to its next stage as cost effectively as possible,” said Kiernan. He then asked the audience what were their barriers to growth, what were the bottlenecks in the business process that was slowing their revenue growth? Kiernan stressed that sales partners are a smart, intelligent and fast way to improve growth. The right partners can assist across the business process from awareness, lead generation and sales to credibility, language, culture and local market knowledge. “The question of whether the partners are direct or indirect is down to who owns the customer relationship,” explained Kiernan. 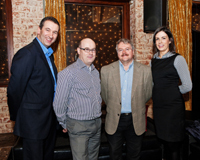 Techbrew is an initiative by the Irish Software Association to address strategic and management issues faced by business managers, technology leaders and product management within the Irish software industry. The format is an informal gathering where peers can learn and share in a supportive and relaxed environment.